So what is going on in the world of Slumbering Oblivion? 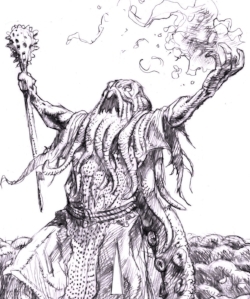 There's something about Cthulhu, the future, and war but what's going on and how did it come to this? I'm glad you asked because below are sections with additional information on just these topics. So check them out and learn what is going on and get a glimpse of life in the not too distant future. Slumbering Oblivion takes place on a near future Earth. But it is an Earth much different from what we know today. How did this happen? Well click the button below and find out! The hosts of Cthulhu are unearthly and have a knowledge of technology that surpasses that of humankind. This section explores the weapons at their disposal and how they are utilized in the war with humanity. What does a battle with the enemy look like? Well, first of all, it isn't always straightforward or fair. And second, it is often impossible to understand or guess what the enemy is up to. In this short comic, a relatively simple mission goes suddenly sideways. It is a short story but introduces characters that will be seen again.